The strict temperature control requirements in modern industrial production process have increasingly higher requirements. The usual way of water cooling (natural water and cooling tower) is inevitably influenced by the natural temperature and therefore the temperature control is frequently unstable making it difficult to control the water temperature for high efficiency and excision. Focusun water chillers are distinct from ordinary cooling water equipment. They have completely independent refrigeration system without any effect of environment and temperature. Furthermore the water temperature can be adjusted and the water temperature can be controlled accurately and efficiently. The independent water circulation system inside water chillers can cycle the water continuously which results the conservation of much water. 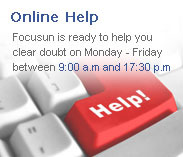 Focusun adopts a user-friendly industrial design that is very easy to operate. Focusun water chillers are excellent quality and many models for various uses. Moreover, each machine can be customized to meet your requirements. Efficient water chillers are essential for modern industrial production because of the many advantages they provide such as improving production efficiency and product quality, both of which lower overall production and maintenance costs. Accurately control the mode temperature and keep the plastic product quality stable. Electronic industry: Keep molecular of electronic components stable and improve the percent of pass; can be applied in the ultrasonic wave cleaning industry and prevents the valuable detergent from volatilizing protecting the cleanliness of the ice. Electroplating industry: Control electroplating temperature, increase plated parts' density and smoothness, decrease electroplating period, improve production efficiency and make product quality better. Mechanical industry: Control pressure oil temperature of oil pressure system to keep oil pressure stable, extend oil use life, improve mechanical lubrication efficiency and reduce wear. Building industry: Supply the cooling water for concrete which will be proper for the building with increased hardness and toughness. Vacuum coating: Control temperature of vacuum coating to ensure the quality of plated parts. Food industry: Applied for high-speed cooling of food for package requirement and control the fermenting temperature, etc. Chemical fiber industry: freeze and keep air dry to improve product quality. Besides Focusun water chillers can also be used in die-casting, printing, biology, vegetables, pharmacy, flowers gardening, etc. It can exactly control the required temperature in the modern industrial processing and improve greatly production efficiency and quality. Our latest containerized chillers are specially designed for cooling the mixing water for batching plants from 45℃ down to less than 0.5℃. 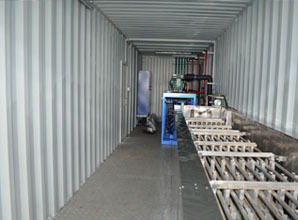 Using evaporative condensers and a 4-stage cooling system these new containerized chillers are superior to any common water chiller available in the world. Our water chillers can provide cold and icy water of constant temperature, constant flow, constant pressure. Focusun can provide you a complete temperature reduction plan by four-stage cooling system no matter how low the effluent temperature is and how large the cooling temperature difference is. First cooling stage: Evaporative condenser is used to lower the temperature of natural water. The first cooling stage can reduce tropical high temperature water of 45℃and above into 36℃; little electricity is consumed but with a good temperature reduction effect. Second cooling stage: plate or shell evaporator is used to lower the water temperature from 36℃to 15℃ and keep evaporative temperature at 10℃ which equips compressor with good energy- efficiency ratio which can achieve 4.2kw/hour. Fourth cooling stage: Focusun unique open-type dipped plate evaporator with gas anti-freezing technology completely prevents itself from frozen crack; constant evaporative pressure adjustive valve control -5℃evaporative temperature which can lower the water temperature from 4℃to 0.5℃. Compressor: use famous brand compressors in the world with excellent performance. Water pump: high efficiency, energy saving and durable with high effluent pressure. Heat exchanger: used to exchange heat between different fluids; evaporative condenser, water condenser, air condenser; plate or shell evaporator and Focusun unique open-type dipped plate evaporator. Controller: advanced temperature controller with stable performance, human-machine interface and high control accuracy. Electric components: air switch, AC contactor, thermo-relay. 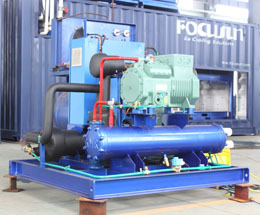 Stable function: imported famous brand compressors with internal security protection: low noise, energy saving and durable. Leading technology:fault-alarm, self-check, signal output and different temperature supervision & control ganged with main unit. High COM/ EER:different stage cooling can be customized so as to improve the energy-efficiency ratio. High excision:imported high accurate digital display temperature controller can control temperature with high excision. Safe and stable:electric components are imported from famous suppliers to ensure safe working and long service life. Easy maintenance:static-free spraying plastic shell with European design, elegant appearance and easy to maintain.